Chicken breasts are a staple in our home for their simplicity and their low fat content. I do love chicken thighs, but I'm the outlier in my otherwise white meat family. But let's be honest, because of their lack of fat, chicken breasts can often be dry if not given some assistance. Marinating your chicken breasts in olive oil, white wine, za'atar and garlic produces a moist and very flavorful piece of meat. Za'atar (also spelled za'tar, zatar, zatr, zattr, zahtar, zaktar or satar) is a blend of spices used in Middle Eastern cooking. It is often found on the tables as a condiment throughout North Africa and into Turkey. I've used Za'atar in my hummus and as a seasoning on baked pita chips. The exact ingredients sometime vary. The mix I use contains thyme, sesame seeds and sumac. I've seen others that also add paprika, cumin, oregano and salt. 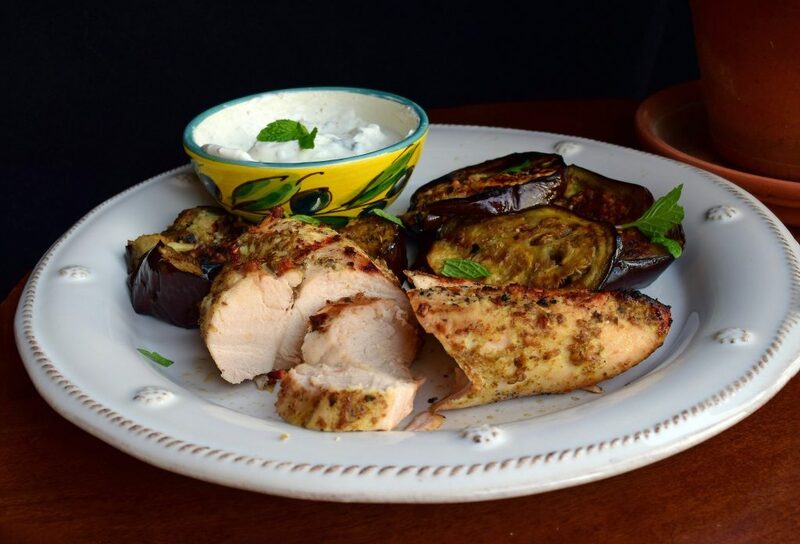 Because of the Middle Eastern ‘feel' of the chicken, we wanted to stay with that theme, so added some cumin-rubbed eggplant and a minted-yogurt sauce to top both the chicken and eggplant. A green salad and maybe some pita bread make this meal complete. Grilled chicken marinated in olive oil, white wine, za'atar & garlic. Cumin-rubbed eggplant & a mint-yogurt sauce finish the meal. We made ours about 9 hours in advance to let the flavors meld. The key is to really crush the mint to release the flavors. We found that adding all ingredients to the food processor and giving them a quick whirl really helped the flavors come together. After mixing, set in refrigerator until ready to serve. Combine all ingredients early in the day and refrigerate. We let ours marinate for 9 hours. One-half hour prior to dinner time, heat grill to medium-high and grill for about 6 minutes per side. An instant read thermometer should read between 150' and 160'. Once removed, the breast temperature will continue to rise. The FDA says it should read 165', but you decide how you like it. Brush with olive oil and rub with cumin and salt on both sides of slices. Add to grill when you turn your chicken (after 6 minutes). They should be ready when the meat is ready. yippee! Don’t think we had leftovers, but I imagine they’d be great on a panini! Good idea. Za’ataar? Zatar? Z’attar? I’ve seen it in so many different foodie stores but was never sure what to do with it so never bought it. Last time I was at a neat spice store, I picked up some specifically for this recipe. I’m so glad I did! The flavor on the chicken is fantastic and the eggplant did not disappoint. Not everyone in my family is a fan of eggplant so I managed to steal a few extra pieces. We will definitely be having this again! Thanks my friend! We love this recipe as well and it makes my heart happy that your family enjoys it as well. Really appreciate you taking the time to review the recipe.